Posted February 26, 2017 by laurielmorrison & filed under Posts with specific prompts or suggestions for specific assignments, units, and books, Teaching, Young Adult Literature. I love a lot of things about books, obviously. But one thing I especially love is the way a novel can provide an accessible, relatively safe entry point into a difficult topic. This year, I added Jason Reynolds and Brendan Kiely’s acclaimed novel All American Boys to the eighth grade English curriculum at my school. Students were engaged in reading, discussing, and writing about the book, and they showed great maturity as we used it as a jumping-off point to talk about racism and police brutality. In this post, I’m going to share some of the resources that I used, as well as an excellent example of student work. My hope is that that these materials might be helpful to other educators who teach books that tackle tough topics, or who want students to complete engaging creative writing assignments that cultivate analytical close reading skills. 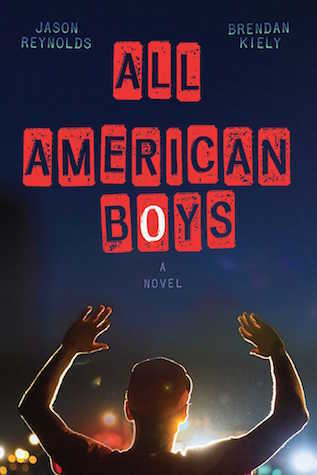 All American Boys is the story of two teens—Rashad, who is black, and Quinn, who is white—and their attempts to deal with an act of violence that leaves their community divided by racial tensions. Because the book has some mature content, I wrote a letter to families to offer them some context. I wanted my students’ families to know why I had selected this book and to be able to continue some of our class conversations. Here’s the letter we sent home. Once families were informed, my next step was to prepare students to read the book. To do that, I drew upon the resources that the publisher, Simon and Schuster, has provided for the novel. It worked especially well to give students an opportunity to hear the two authors talk about their process of writing the book, both in their NPR interview and the brief video interviews that are included on the publisher’s site. We also had some pre-reading discussions about what students knew about the Black Lives Matter movement and instances of police brutality that have been in the news. Then it was time to read. As we read the novel and discussed Rashad and Quinn’s experiences and realizations, students developed empathy for both characters and were able to break down how the characters responded to events in the book and where those responses came from. Moreover, we had concrete passages and characters to refer as we began to have bigger conversations about the issues raised in the novel. Students were so caught up in the world of the book that they were eager to imagine the perspectives of vividly drawn secondary characters, so I gave them a creative writing assignment that asked them to write a chapter from the perspective of any character other than the two narrators. Here’s the assignment-sheet I gave them, which includes a brainstorming guide to ensure that they were engaging with the novel in a thoughtful, analytical way. I also provided my own example, as I often do, so that students could get a sense of how they could write a new chapter that would be original and imaginative but would also fit into, and in some way extend, the existing story. I was very pleased with the work students did on the creative writing assignment. They did a great job of pulling details from the book and then using their imagination and empathy to bring characters’ stories to life. Here is an example of one especially outstanding piece of student work by a very talented eighth grade writer named Hannah. I am extremely grateful for books like this one, which provide such a valuable tool for me to start these kinds of conversations, both in the form of class discussions and in the form of writing assignments that ask students to speak back to and engage with novels. I hope some of my materials might be useful to others who want to spark these kinds of conversations, as well. I love that exercise, Laurie. I enjoyed looking at your assignment sheet and reading Hannah’s piece. She has a future in writing! Thank you so much! Yes, she’s an awesome writer! Thank you for all that information and sharing your assignment. I teach students with intellectual disabilities and I think I could try to scaffold your assignment for them. This will be my first time teaching the book. Thank you! Happy teaching on this tough and relevant topic. Thanks so much for your comment, Liz! Good luck teaching the book and I hope the assignment proves useful! Hearing your thought process was very valuable to me as I will be teaching this text for the first time later this year. Thank you for your willingness to share and collaborate in an online community. From Western MA, I am wishing the best of luck to you and your students! I’m so glad to hear that, Katie! Good luck teaching this wonderful book!